Rail crash survivors have welcomed Network Rail's decision to stop using private contractors to maintain Britain's railways. Author Nina Bawden - who was injured in the Potter's Bar crash in which her husband was killed - said she hoped it was "just the beginning" in a move towards a "proper publicly funded, publicly run rail service". 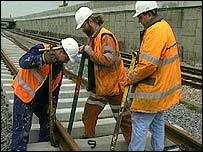 Network Rail will now bring all maintenance work in-house, a decision which will affect seven contracting firms. Unions, passenger groups and rail critics have also hailed the move as leading potentially to safer and more efficient railways. Survivors of the Paddington crash - which claimed 31 lives - welcomed the development as an "obvious recognition" of the importance of safety. "Financial issues have in the past taken precedence over passenger safety," said Jonathan Duckworth of the Paddington Survivors Group. "All we want is a safe railway. Four years on we are still suffering the effects of what happened to us. "This latest development will bring some comfort to all of those who have suffered as a result of incompetent management by rail companies." More than 18,000 workers will be transferred into Network Rail, a move that will double the size of the organisation. Transport Secretary Alistair Darling told BBC News 24 the decision was not an attempt at renationalisation. He said Network Rail, which was set up last year, had had to deal with the "mess that Railtrack left behind" in terms of spiralling costs and inefficiencies. "They've been sorting it out and today's decision makes a lot of sense. "But I still believe that a partnership with both private and public sectors putting in investment, as well as working together, is a better way than going back to the old days, which frankly had more than its fair share of problems." He said although Network Rail was a private company, it had been set up by the government to operate in the public interest, with any profits made going back into the railways. The company's chairman Ian McAllister agreed the move was not renationalisation but more to do with "rationalisation". He said it would ensure "greater consistency of maintenance standards and help deliver efficiency savings more quickly than would otherwise have been possible. Network Rail currently spends £1.2 to £1.3bn a year on maintenance - a bill the company, and the rail regulator, wants to reduce to £1bn. Bob Crow, leader of the RMT union, said he was "over the moon" about the news. "It will be far better now, with people coming to work dedicated to one company, not working for one contractor one week and the next for another. You will see the dedication being put back into the industry," he said. Commentators have described the move - news of which emerged on Thursday night - as the biggest reorganisation of the way the railways are maintained since they were privatised. Some maintain it effectively means a return to the British Rail days when a single workforce was responsible for the upkeep of track and signals. Three contracts had already been taken in-house earlier in the year. The change will affect some of Britain's biggest engineering companies like Balfour Beatty, Jarvis, Carillion, Amey and Amec which carry out the day-to-day upkeep of the rail system. Balfour Beatty said it was "surprised and disappointed" at the decision. But large scale track replacement projects, such as the modernisation of the London to Glasgow line, will still be contracted out to the private sector. Anthony Smith, national director of the Rail Passengers Council, said the maintenance move was a "step in the right direction" and a "relief" for passengers. The move was also welcomed by the Association of Train Operating Companies (ATOC), which represents the firms running passenger train services. "This is a daunting task, but under the circumstances we think it's the right thing to do," ATOC director general George Muir said. "Managers believe they can do it more cheaply and effectively"